Weak Low pressure in the Gulf of Maine helped generate IFR conditions over the northeastern United States early in the morning on 28 February 2013. The brightness temperature difference fields over New England from Suomi/NPP include very sharp cloud edges (also present in the Day/Night band imagery). Because the GOES-R IFR Probability field also includes information from the Rapid Refresh, it is better able to distinguish fog and low stratus, as present over most of Maine, from elevated stratus, present over western New Hampshire and Quebec. The animation of the imagery, above, demonstrates how the GOES-R IFR probability product can be used to monitor the evolving nature of a low cloud field. As the low pressure system in the Northeast starts to move away, the fog/low clouds rotate eastward. Two noteworthy events in the loop are present. The 0515 UTC imagery (mislabeled as 0510 UTC), contains stray light in the 3.9 µm field, and the traditional GOES brightness temperature difference field is therefore changed significantly, but the GOES-R IFR probability field is not. Note also that multiple cloud layers exist over coastal Maine and New Hampshire at the end of the animation, but GOES-R IFR probabilities correctly maintain high probabilities in a region where IFR conditions are present and where the traditional brightness temperature difference field does not show a signal consistent with low clouds. This entry was posted in Cloud Thickness, Day/Night Band, New England, Suomi/NPP on February 28, 2013 by Scott Lindstrom. Stratus and low clouds persisted over western Minnesota and the eastern Dakotas overnight on 25 to 26 February, and the GOES-R IFR Probability field ably captured the region of lowest visibility. Note that the IFR probability field extends into northwest Iowa (albeit with relatively lower probabilities). This is a region where high-level cirrus prevents the traditional brightness temperature difference product from giving useful information about the low levels. In this region, Rapid Refresh data are used to fill in information and more accurately capture the region of IFR conditions. GOES-R IFR Probabilities can be used with MODIS data as well, and the better resolution (1 km at nadir vs. 4 km at GOES nadir) means the MODIS fields have better small-scale detail. Note, for exanple, the sharper edge to the IFR probability field in east-central Minnesota. 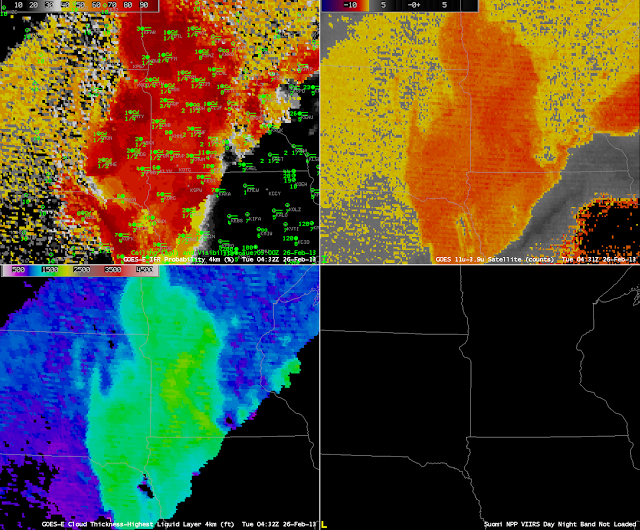 Stray-light issues can influence the 3.9 µm imagery, and therefore the brightness temperature difference field, and therefore the GOES-R IFR Probability field. In the three images above, Stray Light is noteable in the 3.9 µm at 0432 UTC, but that erroneous information can be de-emphasized in the GOES-R IFR probability field because the Rapid Refresh Data in regions where Stray Light is present may show dryer low levels. This entry was posted in Cloud Thickness, Day/Night Band, Midwest, MODIS, Multiple Cloud Layers, Stray Light, Suomi/NPP on February 26, 2013 by Scott Lindstrom. Because GOES-R IFR Probabilities include information about the near-surface atmosphere in the Rapid Refresh Model (and therefore, through assimilation into that model of surface data, the actual atmosphere), IFR probabilities do a better job of distinguishing elevated stratus from fog/low stratus. In the image above from 1100 UTC on 15 February, the GOES brightness temperature difference product, the traditional method of alerting forecasters to the possibility of fog, shows a signal over the high plains of eastern New Mexico in regions where observations show high ceilings. 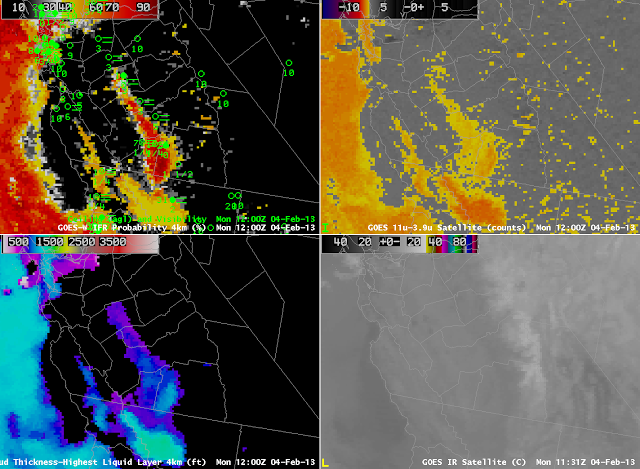 The GOES-R Fog/Low Stratus product computed from either GOES-West data (top left) or GOES-East data (bottom left) correctly restricts the possibilities of IFR conditions to regions between the Sangre de Cristo mountains in the north to the Sacramento mountains in the south. 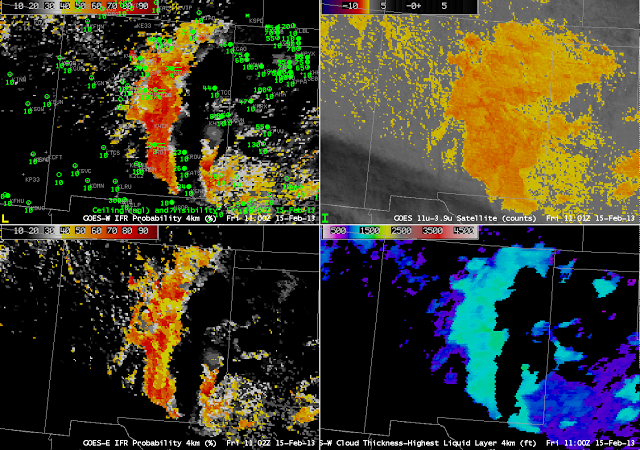 This entry was posted in Emissivity, Rocky Mountains on February 15, 2013 by Scott Lindstrom. 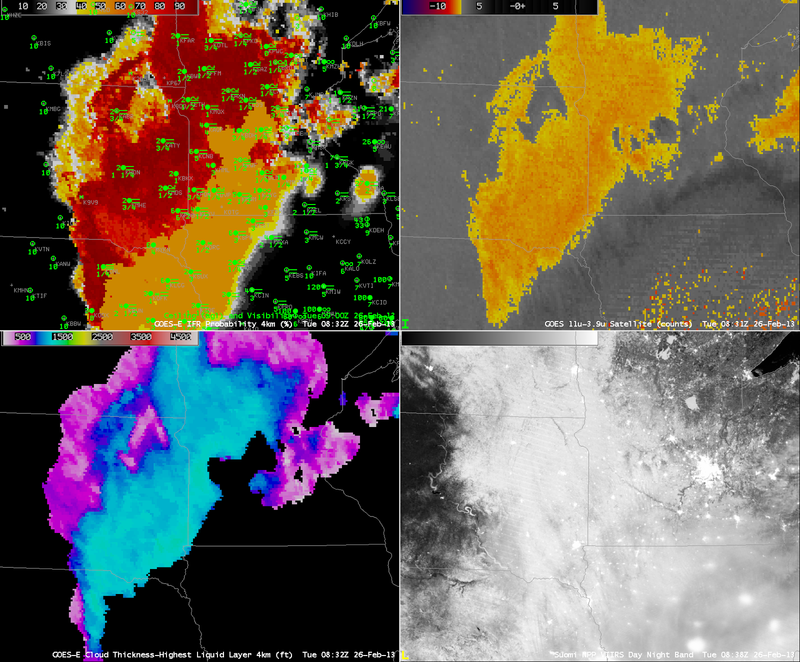 GOES-R IFR Probabilities (Upper Left), GOES-R Cloud Thickness (Lower Left), GOES-East Brightness Temperature Difference (10.7 µm – 3.9 µm) Product (Upper Right), GOES-East Visible Imagery (Lower Right), 0500 UTC on 12 February. This example shows how the IFR Probability Values changed hourly as IFR conditions developed over the north-central Florida peninsula. IFR Probabilities around Gainesville — KGNV — are below 10%. These small values persist through about 0545 UTC, but by 0615 UTC, below, they have increased to around 20% although brightness temperature difference returns have not substantively changed. 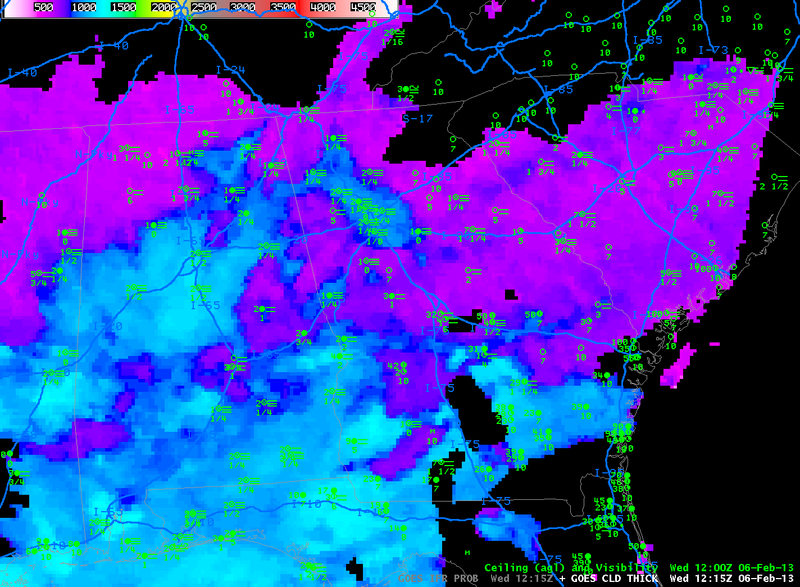 By 0702 UTC, below, values continue to increase, to around 30%, but Gainesville continues to report MVFR conditions. 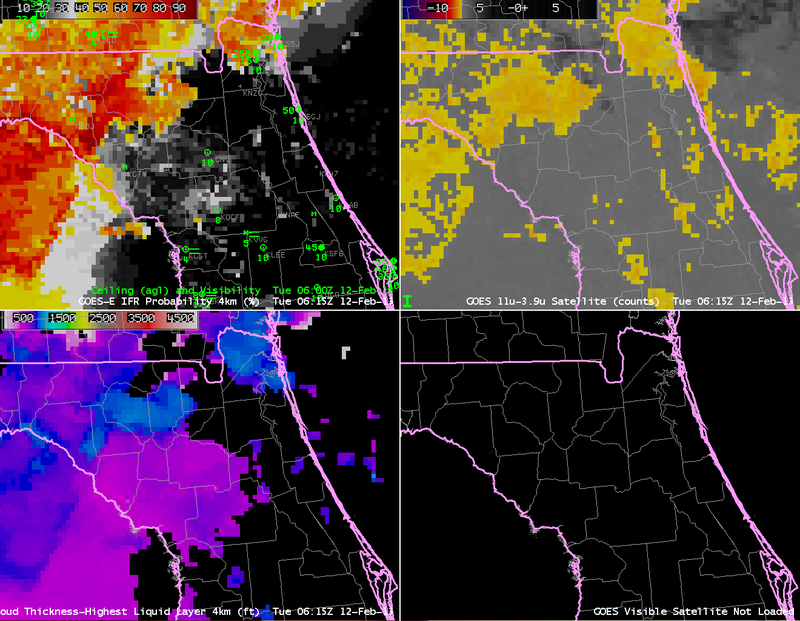 There is a location nearby, however, over eastern Alachua County, where Probabilities exceed 70%. Abundant surface waters in eastern Alachua County — Newnans Lake, Santa Fe Lake, Ledwith Lake, Orange Lake and Lochloosa Lake — may have contributed to the initial fog development there. Note also that the traditional fog detection product, the brightness temperature difference, is also starting to show enhanced returns. As above, but at 0702 UTC. Between 0700 and 0800 UTC (above), probabilities at KGNV increase from 31% to 80%. 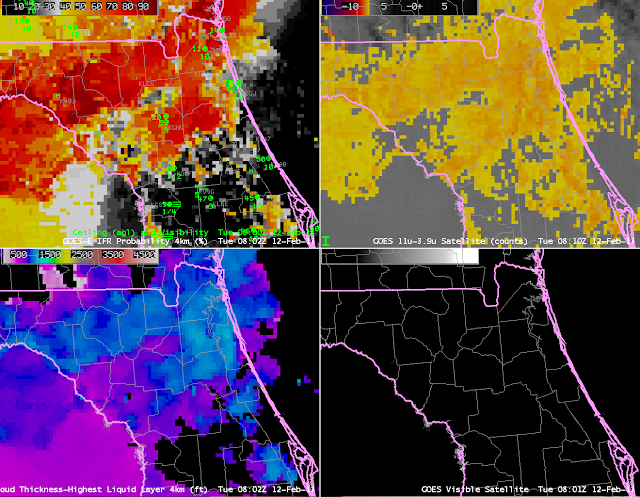 The increase largely results from increases in the satellite predictors of low clouds/fog, as shown in the rapid increase in the brightness temperature difference signal around Gainesville. Nevertheless, ceilings and visibilities at KGNV have not deteriorated to IFR conditions at 0800 UTC. IFR probabilities remain between 70 and 80% from 0800 to 0915 UTC (below), at which time IFR conditions are reported at the Gainesville airport. From 0915 UTC to 1215 UTC, IFR conditions continue at the airport, and IFR probabilities are from 85% to 95%. As above, but at 1002 UTC. This entry was posted in Cloud Thickness, Southeast on February 12, 2013 by Scott Lindstrom. The image above is a good example of the importance of fused data in many fog/low stratus events. 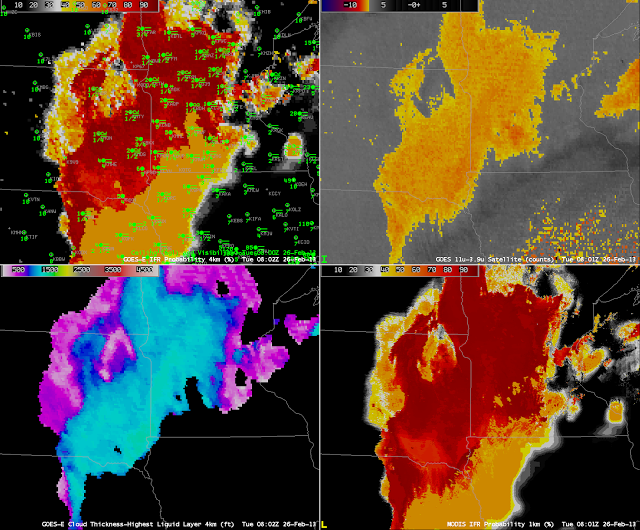 The near IR imagery, bottom right, shows many different cloud layers. A strong storm moving towards the East Coast on Monday morning 11 February generated many cloud layers that make the traditional method of fog detection, the brightness temperature difference between 10.7 µm and 3.9 µm, problematic. Adding information from the model, however, allows the GOES-R product to identify the region of IFR conditions that extends northeastward from central Georgia to central Virginia. This entry was posted in Multiple Cloud Layers, Southeast, Suomi/NPP on February 11, 2013 by Scott Lindstrom. Fatal Crash on I-16 in Georgia: Was it fog-related? A multi-vehicle accident with fatalities occurred in extreme western Laurens County in central Georgia early Wednesday Morning, 6 February 2013. (According to this news report, the first crash was around 1310 UTC) Was fog a factor in this accident? Fog was reported in and around the scene as first responders arrived. VFR CIGS WILL CONTINUE ACROSS THE TAF SITES THIS EVENING. CONDITIONS BY 15Z. LIGHT WESTERLY WINDS EXPECTED. So, overnight fog was considered a possibility at 0000 UTC. THAT TO VFR. WINDS NORTHWEST 5 TO 10KT AFTER 15Z. MEDIUM CONFIDENCE ON ALL ELEMENTS. Note that a mention of LIFR conditions has appeared in the Aviation Discussion. What did the GOES-R IFR Probability show between 0000 and 0600 UTC? Especially in the last two hours — 0415 and 0515 UTC — there is a general expansion in high probabilities from west to east across southern Georgia, with probabilities increasing north of I-16. By 0815 UTC, below, IFR conditions are being reported at many locations in northwest Georgia, and IFR probabilities continue to increase over east-central Georgia. As in the loop above, but for 0815 UTC only. Interstate Highways are denoted in Blue. SINCE MOST PLACES SEEM TO BE HEADED FOR VERY LOW VISIBILITY. THURSDAY AFTERNOON ALONG THE BOUNDARY. AFTER THAT TO VFR. WINDS NORTHWEST 5 TO 10KT AFTER 15Z. GOES-R Cloud Thickess just before Twilight Conditions, 1215 UTC 6 February. Values near the Crash Site are 600-700 feet. The Cloud Thickness field, above, at 1215 UTC, just before twilight conditions, shows values around 600 to 700 feet. This chart suggests a rapid dissipation time of around 1 hour. Indeed, visible imagery around sunrise shows scant evidence of widespread fog. Polar orbiters also provide information — at higher spatial resolution — about the evolving situation overnight. Suomi/NPP made two passes over Georgia between 0600 and 0900 UTC, and the brightness temperature difference product that was produced is shown below. There is a noticeable increase in water clouds over Georgia between 0632 UTC and 0811 UTC, the times of the images. Suomi-NPP Brigthness Temperature Difference (10.80 µm- 3.74 µm) at 0632 UTC and 0811 UTC. 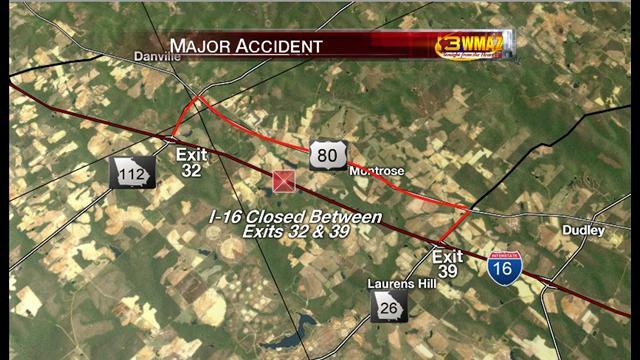 Interstate 16 crosses Laurens County near the center of these images. MODIS data from Aqua were used to produce IFR probabilities at 0645 UTC, below. 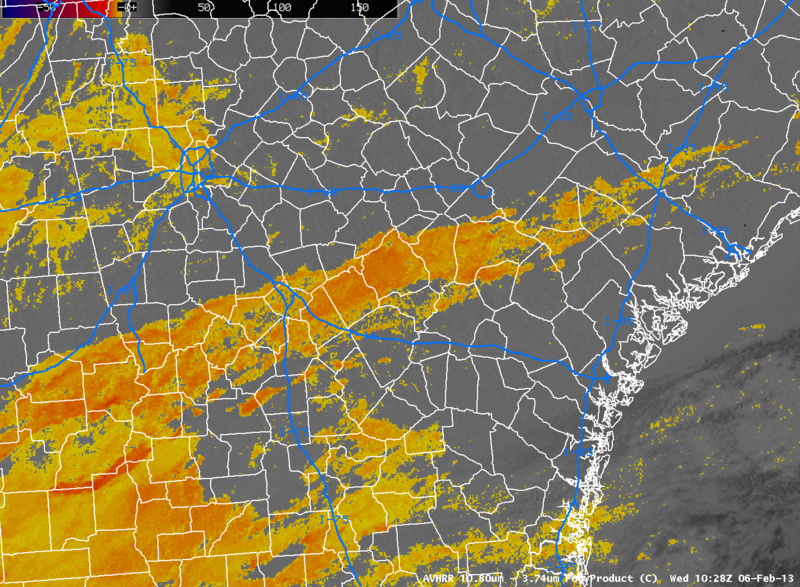 This was before the most fog had developed, but it does confirm the picture painted with GOES data’s broader brush: IFR probabilities are increasing over Georgia. MODIS-based GOES-R IFR Probabilities over Georgia, 0645 UTC on 6 February 2013. Finally, AVHRR data from NOAA-15 from 1015 UTC show widespread stratus extending eastnortheast from southwest Georgia to central Georgia. This entry was posted in AFD, Cloud Thickness, MODIS, Southeast, Suomi/NPP on February 6, 2013 by Scott Lindstrom. GOES-R Cloud Thickness can be used to esimate when radiation fog will dissipate. 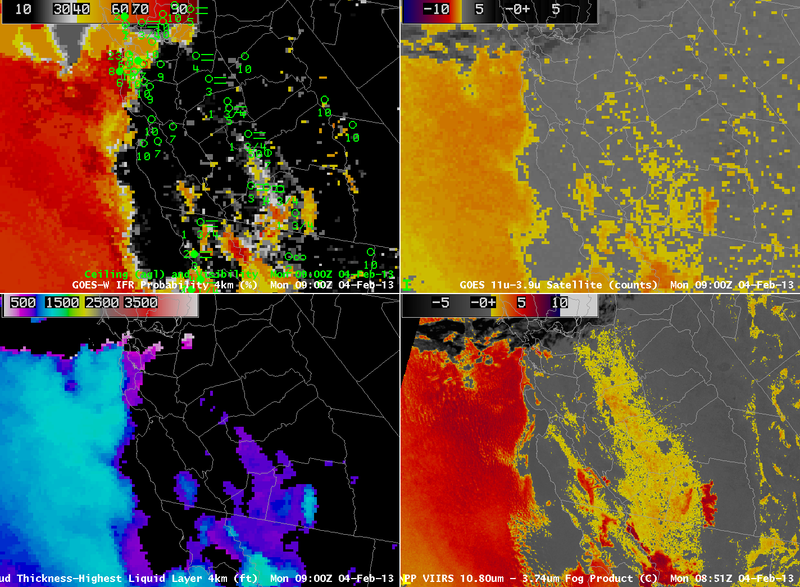 In this example from central California, radiation fog has developed to a depth of around 1000 feet near Hanford, 1000 feet just southwest of Fresno, and 1100 feet near Merced. This chart shows the relationship between Cloud Thickness and burn-off time. 1000 feet correlates well with a 3-hour burn-off time; 1100 feet correlates well with a 4-hour burnoff time. 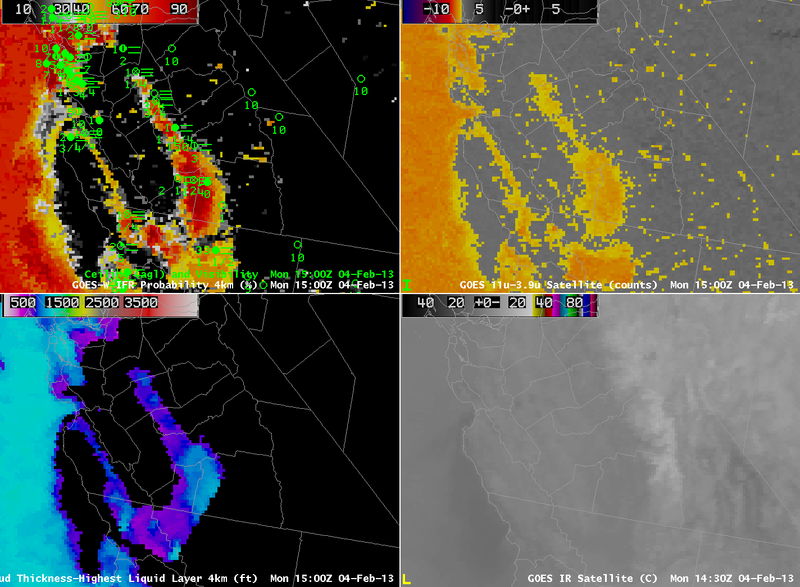 The animation below, with imagery at 1800, 1830, 1900 and 1930 UTC shows that the fog around Hanford was slow to burn off — by about an hour. Fog near Merced was also slow to burn off, but high clouds moving in may have been responsible for that delay. 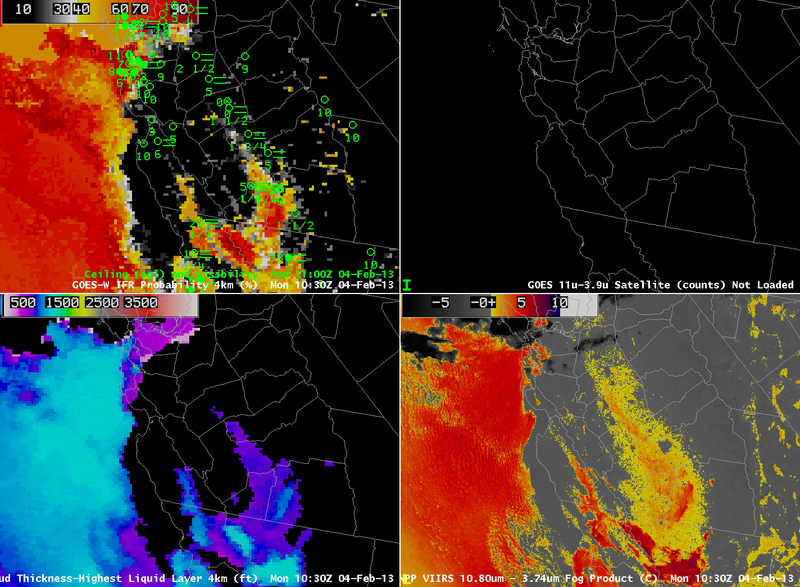 GOES-15 Visible Imagery over Central California. Times as indicated. This entry was posted in California, Cloud Thickness, Dissipation Time on February 5, 2013 by Scott Lindstrom. IFR conditions developed over Arkansas and surrounding states overnight from 4 into 5 February. 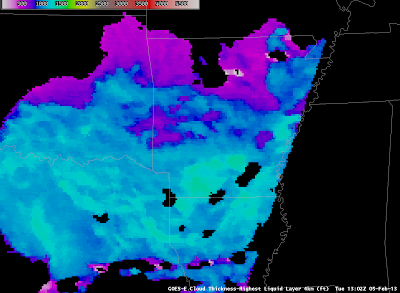 Compare the brightness temperature difference (the traditional fog-detection product) over southeast Arkansas (where IFR conditions are not occurring) and over southwest Arkansas (where IFR conditions are present). Although the satellite signal is very similar over the region, surface observations are very different. The GOES-R algorithm distinguishes between the region with IFR conditions (east Texas, western Arkansas, northwest Louisiana) and the region without IFR conditions (southeast Arkansas, northeast Louisiana). On the flip side, in regions over northeast Arkansas, where the brightness temperature difference product is not showing low clouds, IFR conditions are present, and the GOES-R IFR probability is elevated. Cloud Thickness just before twilight conditions can be used to predict when radiation fog will burn off, using this scatterplot as a guide. The maximum thickness over south-central Arkansas is 1350 feet, and that thickness corresponds to 5 hours after sunrise, or sometime after 1800 UTC. The animation of visible imagery, below, shows that fog/low clouds are lingering over parts of southern Arkansas. GOES-13 Visible Imagery over Arkansas, times as indicated. This entry was posted in Cloud Thickness, Dissipation Time, MODIS, Plains on February 5, 2013 by Scott Lindstrom. Fog develped over the San Joaquin and Salinas Valleys of California early on 4 February. At 0400 UTC, the Brightness Temperature Difference signal shows a noisy signal over the east part of the San Joaquin Valley, with a more coherent signal off the coast and over Kern and Kings County. As above but at 0900 UTC. 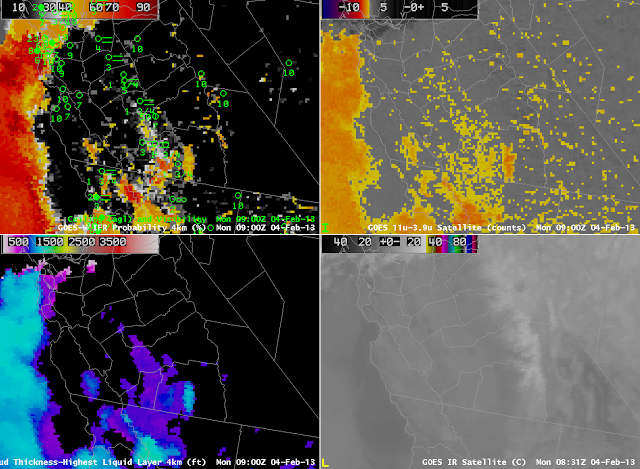 By 0900 UTC, five hours later, although the seemingly noisy signal continued over the California in the brightness temperature difference product, the GOES-R IFR probability field is starting to show higher values aligned through the San Joaquin and Salinas Valleys, where IFR conditions have developed. At 1200 UTC, above, high IFR probabilities extend through the Salinas Valley and in the San Joaquin valley where IFR conditions are noted. 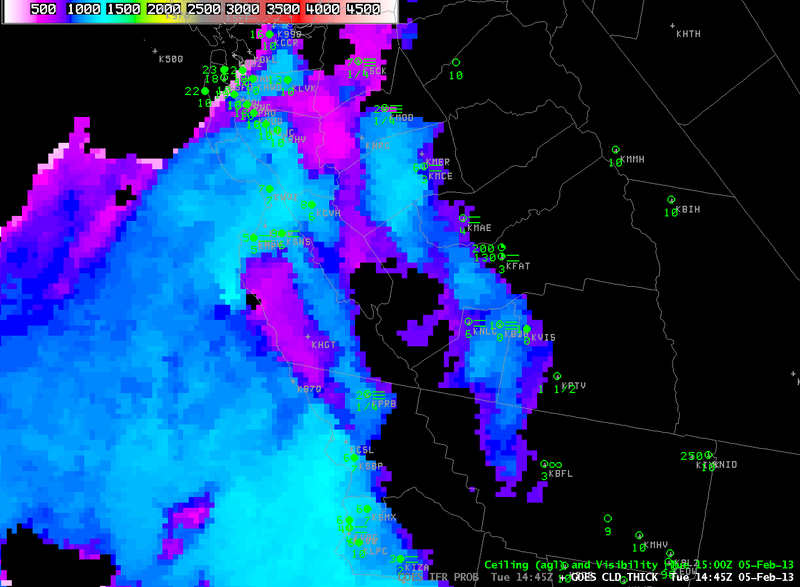 IFR probability is also high over San Francisco Bay where marine stratus has moved inland. The regions of reduced visibility continue at 1500 UTC, the last image before twilight conditions disallows computation of Cloud Thickness (indeed, the terminator is apparent in the image). 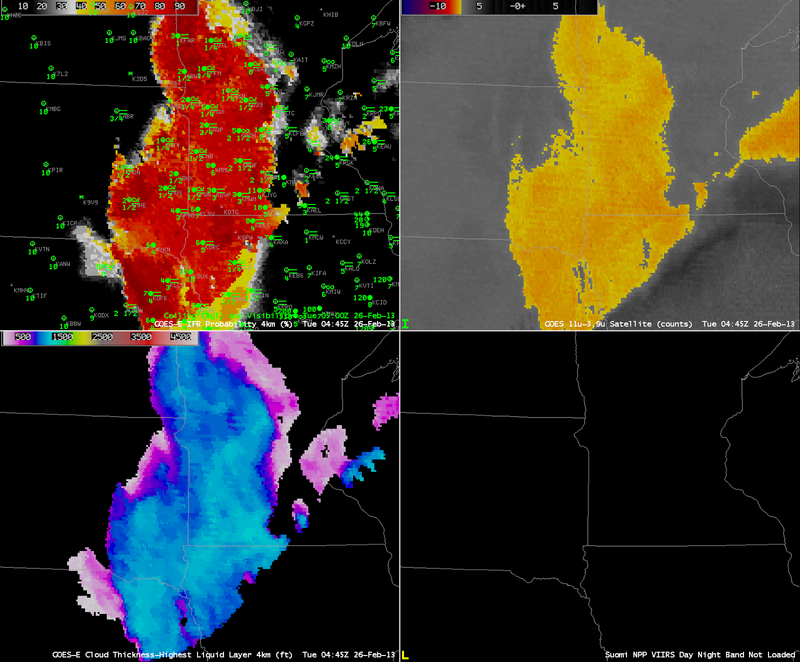 The cloud thickness of 1100 feet suggests, based on this scatterplot, a dissipation time of around 4 hours. The animation below shows visible imagery at 1730, 1830 and 1930 UTC that aligns with the predictions. GOES-15 0.62 µm Visible Imagery, times as indicated. Suomi/NPP VIIRS data overflew this region twice during the night, and provided brightness temperature difference information at high spatial resolution. 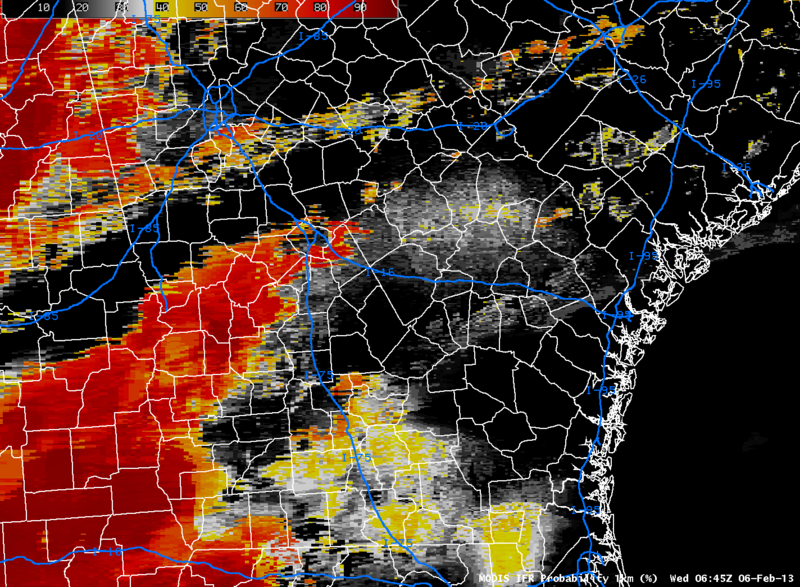 The GOES-R IFR algorithm is not yet applied to Suomi/NPP data (like it is to MODIS data) however. As at top, but with Suomi/NPP Brightness Temperature Difference (10.8 µm – 3.74 µm) in the lower right, at ~0900 UTC. As above, but at 1030 UTC. This entry was posted in California, Cloud Thickness, Suomi/NPP on February 4, 2013 by Scott Lindstrom. Fog developed in the early morning of February 1, 2013, in California’s Central Valley, the combination of the San Joaquin valley to the south and the Sacramento Valley to the north. The imagery above shows the GOES-R Fog/Low Stratus product and the traditional fog product, the brightness temperature difference between 10.7 µm and 3.9 µm. The GOES-R Product (IFR Probability) is first in highlighting the development of fog near the San Joaquin River and reductions in visibility occur in sync with the increase of IFR probabilities. The traditional GOES-West brightness temperature difference product displays considerable signal in the first hours of the animation above, but there is no organization to the signal. 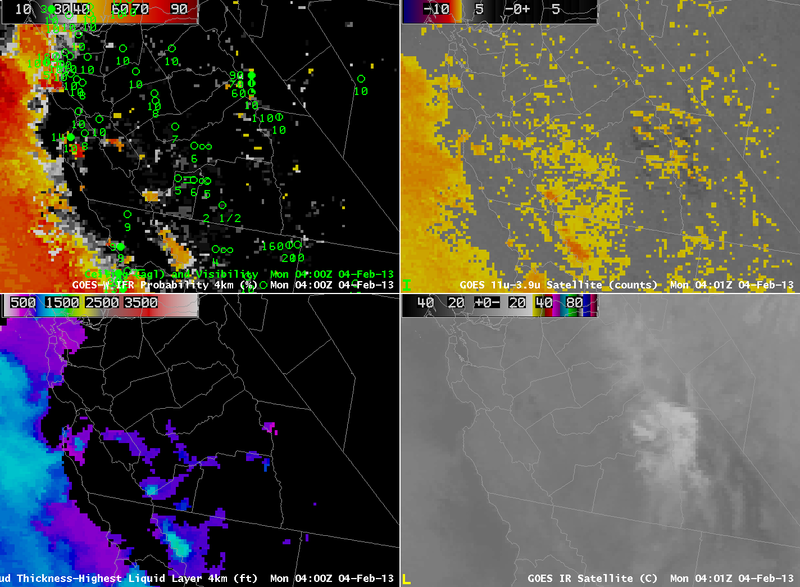 Eventually, however, the brightness temperature difference signal does include the fog and low stratus in the Valley. This entry was posted in California, Cloud Thickness, Terrain on February 1, 2013 by Scott Lindstrom.